Whittlesea is a township with surrounding rural area 36 km north-east of central Melbourne on the Plenty River. It is also a municipality extending southwards to Reservoir and Bundoora in metropolitan Melbourne. Whittlesea was probably named by a local surveyor who had lived in Whittlesey, England, when he surveyed the township’s site in 1853. An alternative reason for the name is the presence of a swamp near the township, which may have reminded engineers/surveyors of swamp draining works recently carried out in Whittlesey, England. European settlers traversed the Plenty Valley to the Whittlesea township area by 1837. The town survey of 1853 was followed by the building of an Anglican church and school two years later. In 1865 Whittlesea was described as having mostly flat but deteriorated farmland caused by inattention to manuring, being suitable only for grazing in most places despite the confluence of three streams near the headwaters of the Plenty River. 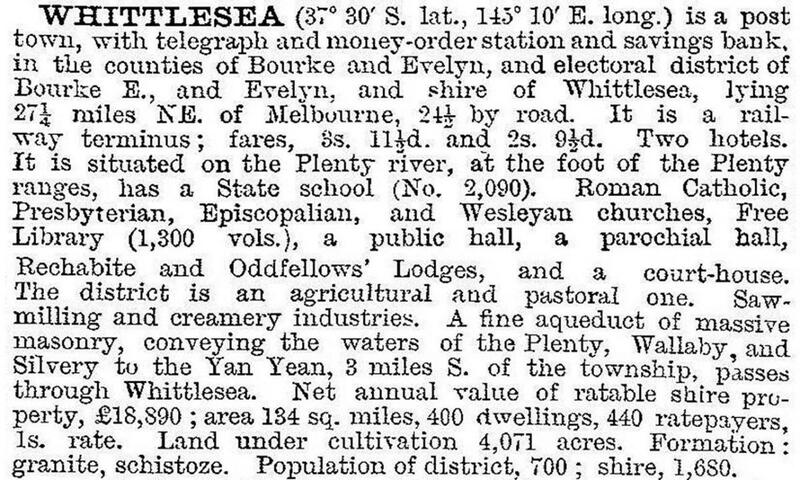 In 1863 the Whittlesea Road District Board was formed, and the district population was about 900. The district was bounded by the Kinglake Ranges, the Plenty River, Arthurs Creek and Morang. When the Whittlesea shire replaced the District Boards in 1875 the boundary went further west, taking part of the Darebin shire. 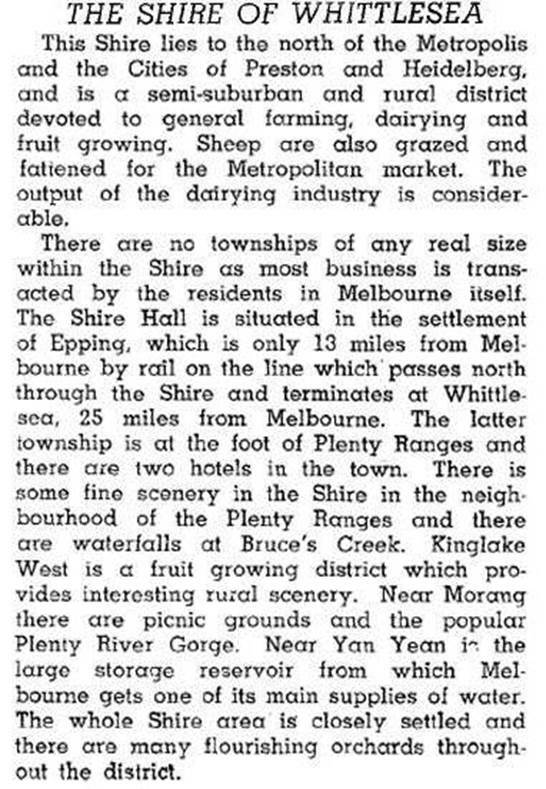 In 1915 Whittlesea shire was amalgamated with its westerly neighbour Epping (previously Darebin) shire. This added a more populated area to the Whittlesea shire. Population growth between the wars occurred in the southern part closest to metropolitan Melbourne; the township’s population hardly changed from around 500. A strong annual event in the township has been the annual agricultural show, first held in 1859. It drew entrants from the whole shire. Its district exhibits gained high awards at the Royal Melbourne Show from 1903 to 1939 including wool, wine, apples, ham, bacon, pasture, potatoes, eggs, butter and cheese. During the postwar the township slowly grew, particularly during the 1950s. The shire offices however, were located elsewhere: at the Mernda mechanics’ institute, the Epping shire hall and finally at a new civic centre at South Morang. The township remains the major centre for the foothills of the Plenty Ranges with a Catholic primary school, a state primary school, a secondary college, churches, sports facilities, public park and shopping centre. The primary school, built in 1878 from local stone, is on Australian and Victorian heritage registers. In 1959 the railway line between Lalor and Whittlesea was closed, but the rail reservation has been kept. Proposals to rebuild the line to Mernda and to South Morang have not materialised, except a reopening to Epping in 1964. The Whittlesea shire grew quickly during the period 1950-1990, mainly in the southern areas of Bundoora, Epping, Keon Park, Lalor, Mill Park, South Morang and Thomastown. In the 2000s Doreen (west of Yan Yean Road) was transformed into a residential suburb, Mernda closely followed Doreen and land banks were secured in Wollert. Whittlesea was made a city on 15 April 1988. On 15 December 1994 Whittlesea city was reduced in size when the area west of Merri Creek was transferred to Hume city and the area east of Yan Yean Road was transferred to Nillumbik shire. The urban areas in the south of the municipality were all retained, but with an area of 490 sq km Whittlesea city remained predominantly rural. Whittlesea city’s rapid population growth since the mid-1980s has altered the former Anglo-Celtic character.